I am primarily a fantasy and historicals fan, but over the summer months I have been looking around at sci-fi minis. I wanted to find more figures I might be able to use in the upcoming Studio McVey Sedition Wars game, but I was also inspired by a trio of summer films: Prometheus, Total Recall and Dredd. A common thread among this little lot, if one exists, is that they are "hard-fi" rather than space opera - human centric rather than bugs and aliens. 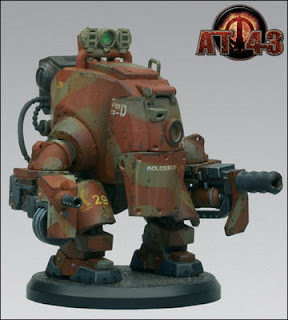 The now-defunct AT-43 was a game system released by Rackham, the figures coming pre-painted. It completely slipped under my rader a few years ago, I wonder why it never took off, some of the figures are stunning? Antenocitis Workshop make a growing range of modern combat/near future figures and vehicles and scenery that are well worth checking out. In a similar style is this limited edition recent release by Studio McVey. 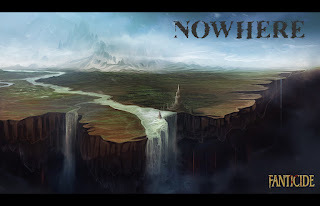 Dreamforge Games have recently run a successful kickstarter campaign (well, these days, who hasn't!) 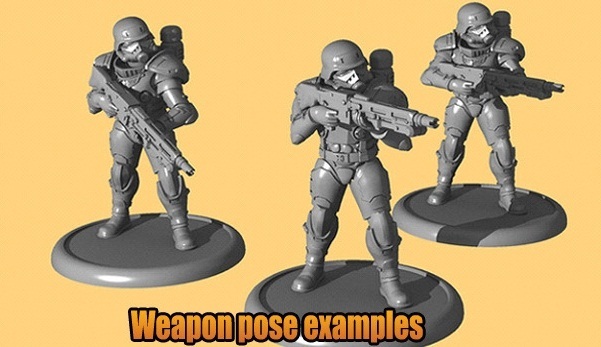 and are working on some Eisenkern stormtroopers. If you need some slightly bigger boots on the ground, mantic are releasing some tasty looking enforcers in the near future, in a galaxy not too far away! That's it for this sci-fi issue. When my copy of Sedition Wars arrives I will have dozens of figures to paint up, but it's always nice to dream about how it could develop. This is the first unit of my Saxon Warband, twelve stout hearted conscripts. These troops are recruited from the villages and settlements of the warlord's territory. They are not highly trained soldiers with good equipment, but farmers and herdsmen, hunters and woodsmen, armed with a spear and a shield and maybe a helmet or axe. The bulk of the unit is made from the Wargames Factory Saxon Fyrd boxset, with a few bits courtesy of Gripping Beast. I wanted to arm them with mostly spears, as this denotes their lesser status. Swords would be restricted to the warlord's elite troops, but axes I reckon would be fairly accessible to villagers and commoners. For the palette I had a good look around on the web and in my history books. There's no definitive answer to how the clothes would have looked, so I went with a pragmatic approach of fairly neutral and muted colours. The shields I decided on a fairly uniform palette, to tie the unit together. There's no real world evidence that I can find to describe how the shields would have looked, what colours or symbols would have been used, only that they would have probably been made from wood with leather stretched over the rims. So I scraped off the nails and treated the shield rims as leather rather than metal. 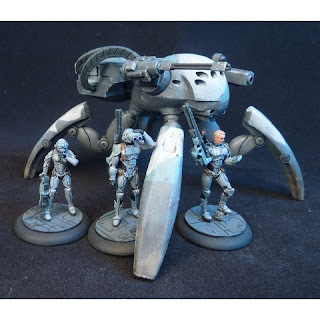 The bases are pennies, they are the ideal size for these figures. There's a bit of work building up the ground to level with the raised plastic tab, but it's nothing too complex - I just glued on two layers of sand. Modern pennies are magnetic, so I can re-use these figures at a future date in a magnetic movement tray, if I want to progress to element or unit based games, such as Dux Bellorum, Clash of Empires or Hail Caesar. But for now, this is the first unit of my Saga Saxon warband, weighing in at a whopping one and a half points. Next up, a dozen armoured saxons. Avatars of War have released a unit of harpies. 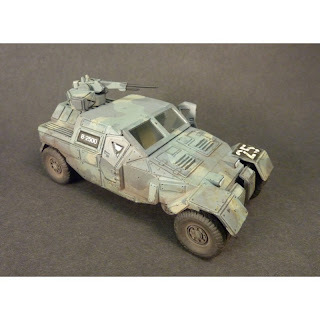 Made of Warcast (a mix of plastic and resin I believe), there are five different models. Looking at the product images on the website it seems that the heads are interchangeable, maybe the wings too. For full details, bigger pics and even a video, check out this link to their website. Obviously these figures could be used by Chaos and Dark Elf players. If I were to buy them, I would get multiple uses out of them. 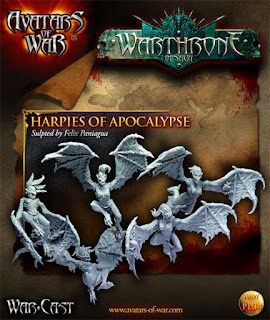 Yes, they could be included in my Chaos army, but my first thought for them was to use them as fell bats. A 40mm base with appropriate terrain/mini diorama, a plastic stand and a magnetised harpie or two, job done. 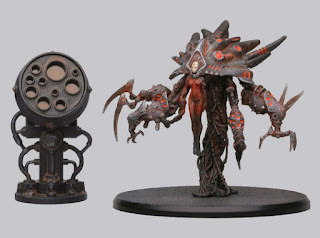 When the bloodsucking tasks were finished, the harpies could be removed and then added to a 25mm base (via the magnet) to perform Chaos duties. Sadly, I am pretty sure they could not be used in my Dwarf or Elf armies, denying me the hat trick! This post came, quite literally, from Nowhere. There I was, sipping my morning cuppa and browsing my must-read blogs, when I came across this article from the Laughing Ferret (always entertaining and thought-provoking and a little off the wall, all excellent qualities in a blog). My initial reaction was, groan, yet another kickstarter project - after this summer of so many projects, I am starting to feel a little bit of startup fatigue. It's not so much the strain on my wallet, though that's a factor, it's just that there are not enough hours in a day to enjoy all the hobby goodness that keeps coming along. So it was with some trepidation that I hopped on to the link to the kickstarter project. After looking at that I was a little bit puzzled, but also intrigued, so I went and had a look at the website. If you have not checked out the links, the rest of this post will not really make much sense. 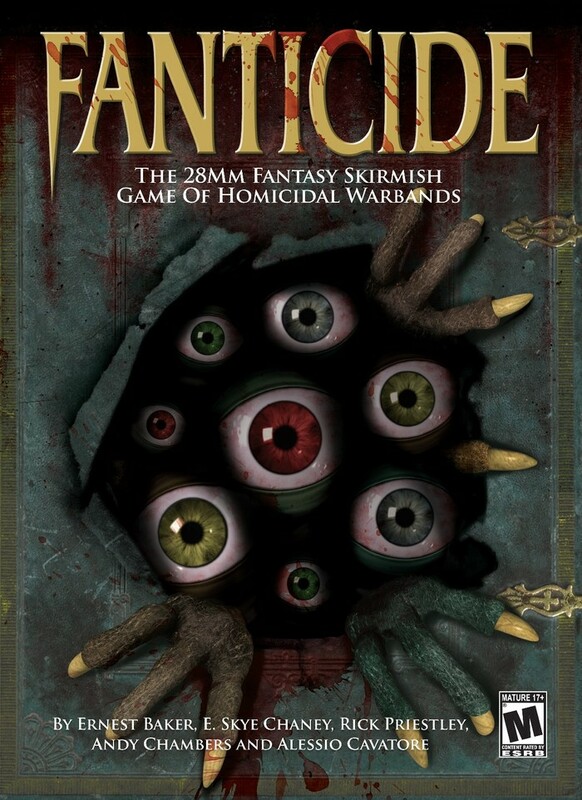 If you have, then you will know that a new fantasy skirmish game called Fanticide is in the pipeline. If you watch the video on kickstarter, or read the background blurb on the website, you can get a good idea of the direction the project is heading. The sample pages of the rulebook are about the most informative. When I read about the game, my first thought was "this is a fantasy version of Saga". It's a skirmish game, rather than unit or element based. It's played on a smallish surface (4 x 4 is recommended, but smaller is possible), just like Saga. Each player has a warband of around 30 - 40 miniatures, split into smaller "squads", plus a leader. Saga is very much the same, with warbands comprising 25 - 70 figures, with 30 - 40 being the norm. Rather than the traditional IgoUgo system, it employs a card activation system, similar to Saga dice and battle boards. 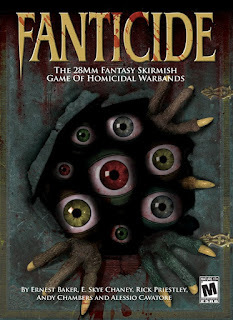 Fanticide does also include some more traditional wargame features, like units stats, dice rolling combat (D10 rather then D6), etc. So it seems to me to be Fantasy-Saga-with-extra-bits! 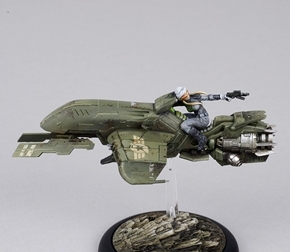 Saga is the best game I have played this year, but I do miss my fantasy models, so this could be the perfect mix. The whimsical nature of the background and the warbands will not appeal to all players. After nearly two decades of grimdark Warhammer, I like my fantasy to be "real" or "gritty", anime and cartoon don't really appeal to me. With this in mind, looking at the four warbands, I immediately started to substitute in figures from my own collection. Where Fanticide has one-eyed creeps, I see plaguebearers. The Fae could easily be substituted with elves, dryads and treemen, the satyrs are obviously beastmen. It would even be possible to build a centaur army from wood elf/beastmen bits. My existing collection of plastic already covers these three of the four starter warbands, though I am struggling to come up with alternatives to the flying monkey army. 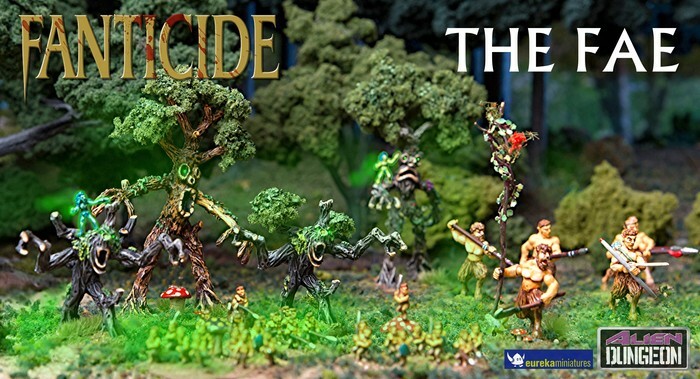 The best thing about Fanticide is that it includes a system to allow you to design a warband to fit your own collection of figures. It's probably a fairly generic set of suggestions, relying on the common sense and fair play of the gamers, so not one for die-hard tournament gamers. But for me, it sounds ideal. 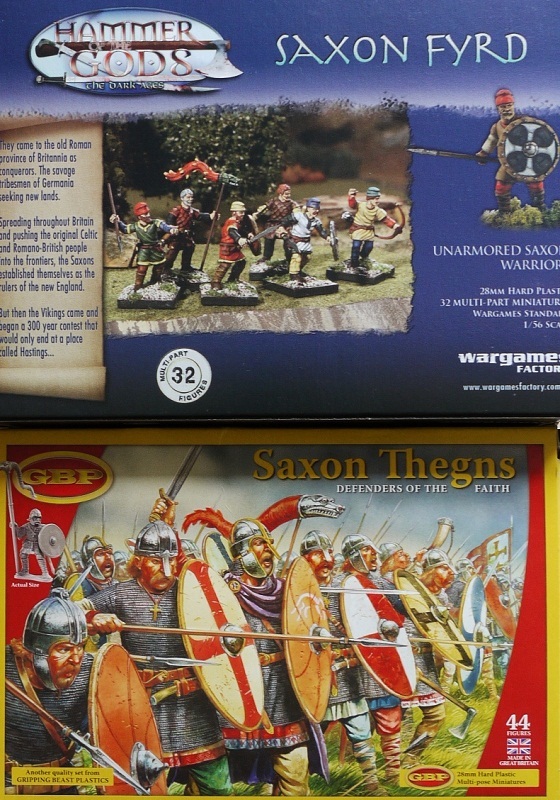 I relish the thought of a game in which I can use my dwarfs, my undead, my chaos warriors, but I could also pitch in with my up and coming Saxons. Or how about ancient Greeks or Romans fighting against mythological bands of centaurs, or hordes of skeletons? 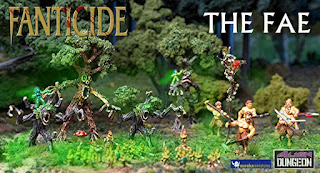 It's a bit early to say, but finally I might have found a game that means I don't have to sell all my fantasy figures. I have finally made a proper start on the Saxon warband. These two boxsets plus a packet of bits from ebay (more bodies and arms) give me over 90 figures to get to work on. My plan is to use the figures to represent several factions, by starting with fairly generic unarmoured troops with spears. Two dozen of these gives me a core set which can be used in several ways. The first option I am working on is a 7 point Saga Saxon warband, comprising 12 armoured warriors, 24 unarmoured warriors and 12 levy (plus warlord). The second option would be to replace the armoured Saxon warriors and warlord with Anglo Danes. It should also be possible to use the unarmoured troops as vikings, if I ever wanted to go that way. 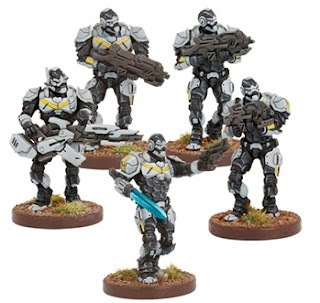 The longer term goal is to be able to use these figures in a variety of games. 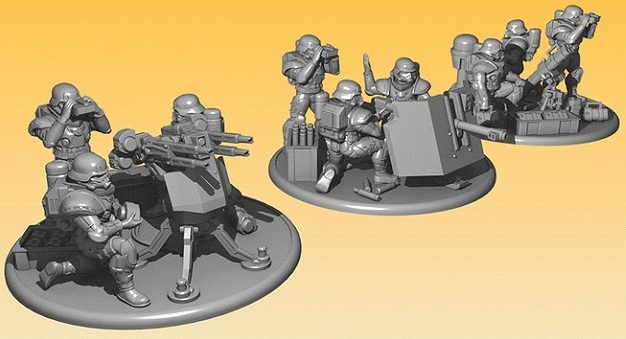 Saga is a skirmish game, but I would also like to be able to use them in more traditional unit based wargames. Choosing which ruleset to use is a saga in itself, there are several to choose from, but a vague plan is shaping in my head. The main task at this stage is to ensure that the figures are adaptable. With this in mind, I am basing them on pennies. 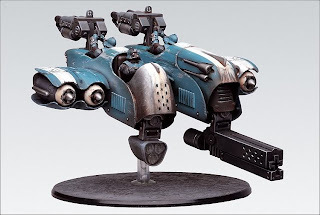 These are magnetic and so it should be possible to add them to magnetised movement trays at some point in the future. 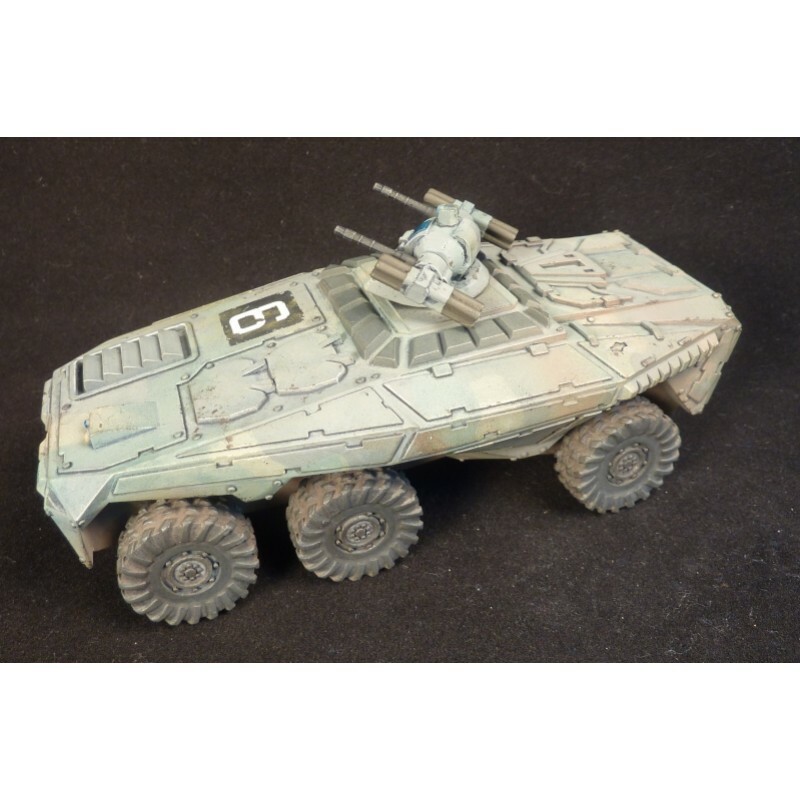 Back in the present, I have already built my first unit of 12 unarmoured troops and am painting them up. More on this soon.